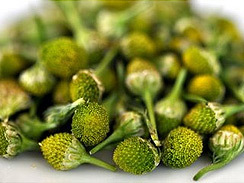 People often mistake pineapple weed for chamomile. I myself made this easy mistake when I first started noticing it growing along the edges of a large dirt parking lot. It wasn’t until I began researching other plants for this webpage, that I realized my mistake. 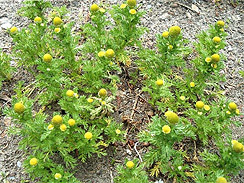 Pineapple weed has lacy greens, whereas chamomile’s greens are soft and round. Like chamomile it’s a fluffy plant, usually growing only a few inches high, hovering near the ground. 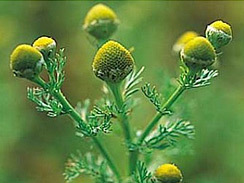 Pineapple weed has a lovely fresh scent that smells faintly of… you guessed it… pineapple. It’s perfect for steeping in teas. This plant loves poor soil and lots of light. Look for it along the edge of cleared bare land, in compacted dusty soil. Bring water to a boil in small saucepan, remove from heat. Add pineapple weed, scented geranium leaves and mint. Cover pot, allowing tea to steep for at least five minutes. Meanwhile, combine milk and sugar, heat until milk foams and becomes frothy. Strain tea into milk, holding back the herbs. Heat again if needed. Enjoy. Heat frying pan over medium flame. Once pan is heated, melt 1/2 tbsp of butter, then add all buds. Allow buds to cook slowly, about 2-3 minutes, making sure pan is not hot enough for butter to brown. In meantime, place 1 tsp of honey with 1 tsp water together in a soup bowl, whisk together. Now, turn flame to high, toss almonds in with the buds, and quickly sear for about 30 seconds, turning and scraping once or twice. Remove to bowl with honey mixture. Sprinkle on a pinch of salt, gently stir with spoon to combine all ingredients, coating buds. * wild mustard buds look like tiny little broccoli florets, the state of the flower head just before blooms emerge.